The idea of injecting a solution into open skin is an old-school technique that has been modified and patented by several companies that aim their marketing towards the tattoo industry. This method claims to open up the epidermis with a tattoo machine or similar machine, allowing the needle to penetrate deep into the dermis where the deepest ink pigments settle after time. A “proprietary solution” is then injected into the dermis where it is claimed to oxidize or encapsulate the ink particles and bring them to the surface of the epidermis in the form of a scab. If left undisturbed for 9-12 days, the scab will then peel, theoretically bringing the ink with it. A topical agent is then usually required to minimize scarring. The deep and repetitive puncture of a needle into the same area to form a wound deep enough to reach the ink molecules is a recipe for hypetrophic and keloid scarring. Just one round of this process can cause these unsightly scars. Using the injection technique on a 2″ x 2″ area will require at least 4-8 treatments. There is also a lengthy healing time upwards of 16 weeks, and infection during this time is common. Once the wound has been created in either a dot pattern or all over the entire pigmented area, a “proprietary solution” is then injected into the skin claiming to oxidize or encapsulate the pigment and bring it to the surface of the epidermis in the form of a scab. These solutions often contain some form of acid, chemicals used in laundry detergent and household cleaners, or “natural” sea salt, saline solution and lemon oil. The process referred to as oxidizing or encapsulating is actually necrosis (the death of cells), which causes an inflammatory response and in turn forms a scab above the traumatized area. 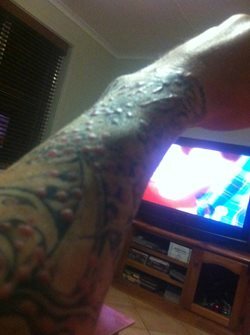 The chemicals and necrotic cells that are left underneath the scab are then trapped inside of the dermis and can cause an allergic type of reaction, leaving the area permanently itchy and inflamed as shown in the picture below. At this point, surgical excision of the area would be the only treatment. None of the non-laser tattoo removal injection solutions available today are FDA approved. There are no regulated clinical trials with transparent results readily available to the public. The medical aesthetic community does not accept injection as a safe or effective method for tattoo removal, and in fact, Dermatologists issue concerns about the complications of non-laser tattoo removal in the news article below. The bottom line is, laser tattoo removal is the only FDA approved and medically compliant method that is both safe and effective. No Comments to "The Dangers of Non-Laser Tattoo Removal"
COPYRIGHT © 2017 THE NEW CANVAS. ALL RIGHTS RESERVED.